There is something about being on stage—even when there is no audience—that demands that actors perform. One, dressed in a hoodie and pin-legged jeans, spins in a pirouette, landing soundly; another whips out a simple soft shoe, a step that was probably learned in a beginning class as a child; a barefoot girl stretches on the floor, then walks about the stage, finding her place, getting familiar. The Robinson Theater is empty except for a dozen or so students gathered on the dull black painted stage marked with scuffs and scratches. The curtain is lifted, revealing the workshop just behind the actors that is filled with saw horses, tools, rows of paint cans with colors streaked down the sides, old props, and new ones in the making. 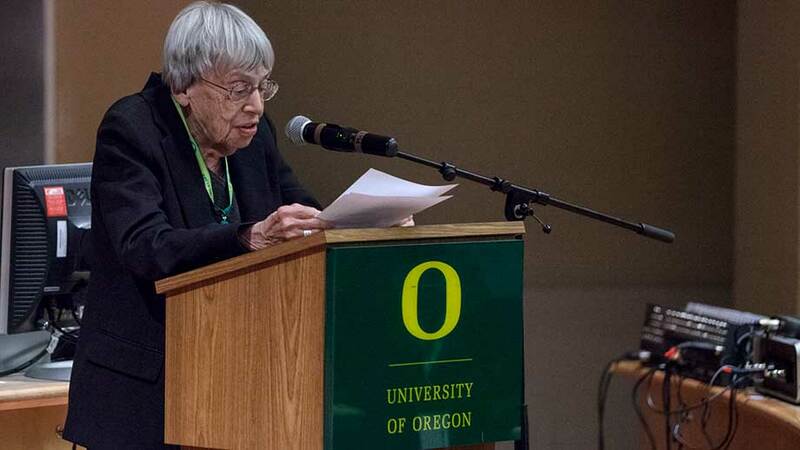 The students have been cast in the University of Oregon's production of The Left Hand of Darkness, based on the famous novel by Oregon’s most celebrated author, Ursula Le Guin. They are a part of a unique effort between the author and John Schmor, a professor in theater arts and the director of this production. Schmor not only adapted the script but collaborated with Le Guin through emails and phone calls from her home in Portland for more than two years. For the students involved in the production, it is a unique experience to see how a work evolves and changes in the process of staging and how important the contributions to the book’s author are to the context and meaning of the play. 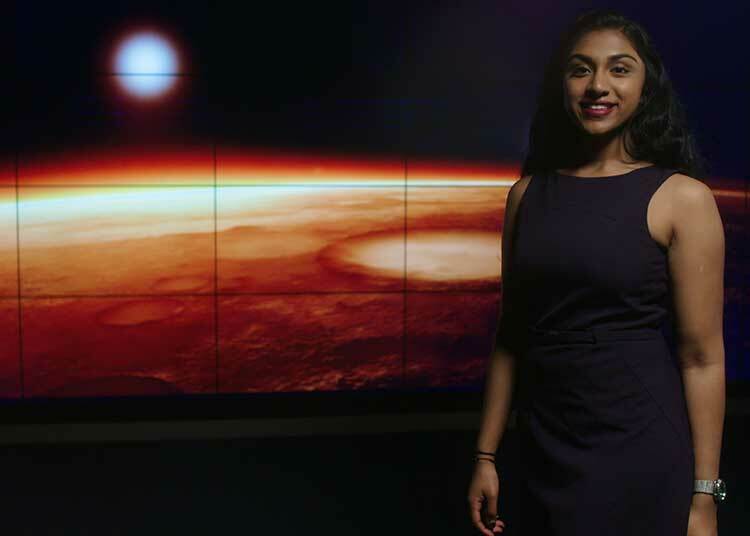 “I’m reminded every time I am a part of a production how critical working as a team is, and this experience was no different,” Manju Bangalore, who plays the lead role of Estraven, says. “The cast and crew have come together in such an important and impactful way. I am proud to be a part of this team. “We rescue each other,” she adds quoting a vital line in the play. Someone’s leg audibly pops during a stretch; the student laughs and apologizes for the stomach-flipping sound. Schmor sits in one of the back rows of the empty theater, scanning notes before tonight’s rehearsal begins. 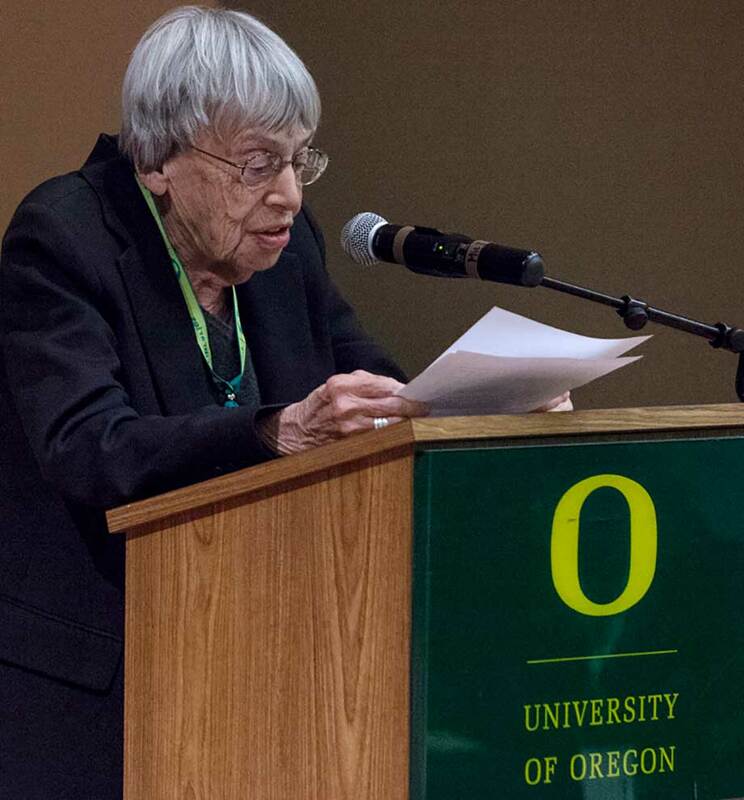 By many measures, she is Oregon’s most celebrated and accomplished literary figure. By any measure, she is a remarkable storyteller with an audience of millions that spans generations and continents. Together, Schmor and le Guin not only retooled the narrative of the book, which won the prestigious Nebula Award for science fiction literature, the Hugo Award, the James Tiptree, Jr. Book Award, and the Gaylactic Spectrum Award Hall of Fame, but also made new discoveries about the meaning of the book and the characters themselves. 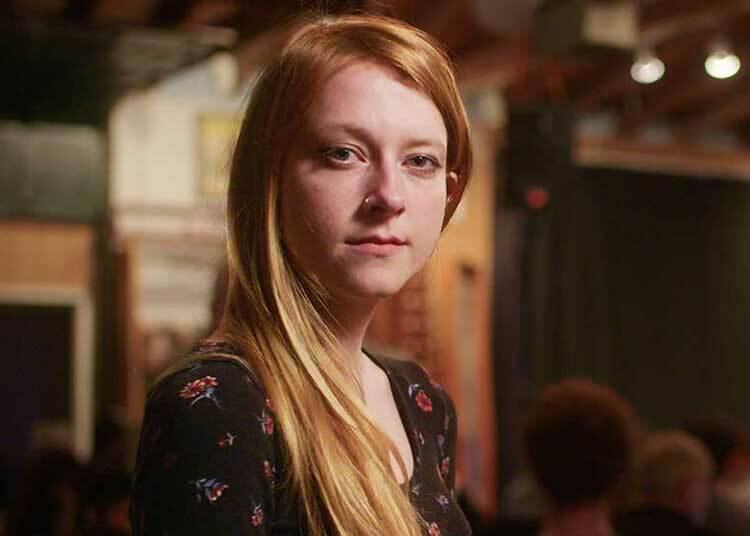 Schmor, who had adapted an earlier version of the book for Portland Playhouse in 2013, decided that the story lines warranted a closer look when bringing it to the University of Oregon. 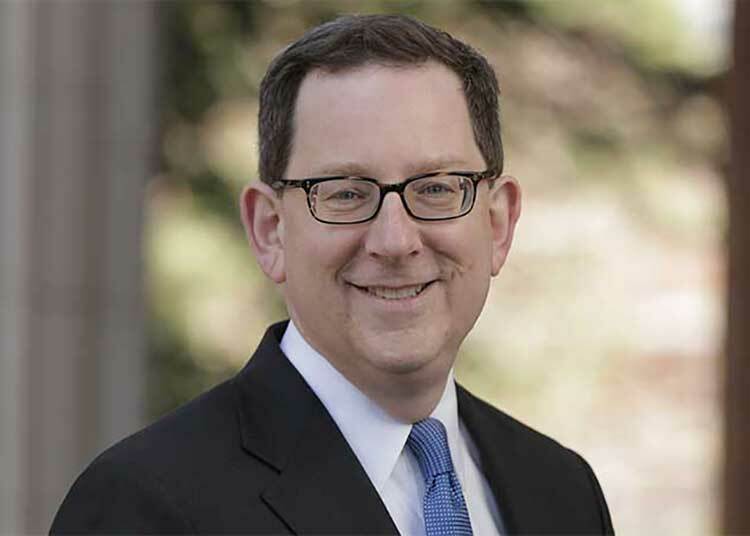 While the Portland production sold out and extended its run, Schmor felt he needed to approach the work differently because of the size of the Robinson Theater, which is considerably larger than the Portland venue had been. He wrote to Le Guin and asked for permission to take another crack at it. He restructured the play, sending notes to Le Guin, who responded with a striking insight: In 1969, when the book was published, she understood that no editor would allow a female author to write a novel without gender pronouns, which is how she saw her characters. She then asked Schmor to scrap the pronouns, and return her characters to her original vision—a planet called Gethen full of people with no gender. Schmor welcomed the challenge and went to work. Their partnership continued back and forth, and it was through the new adaptation that Le Guin learned something about her own book that she had not realized previously; that the core of the book is to stop the invention of war. “She replied that yes, that had just been clarified for her in this script,” Schmor says. But removing gender from an established work and re-tooling those definitions to become more fluid, students had to think through what it meant to play a character without a “solid” definition of sexual identity. It’s been an experience that has lifted the gender boundaries found in traditional productions. 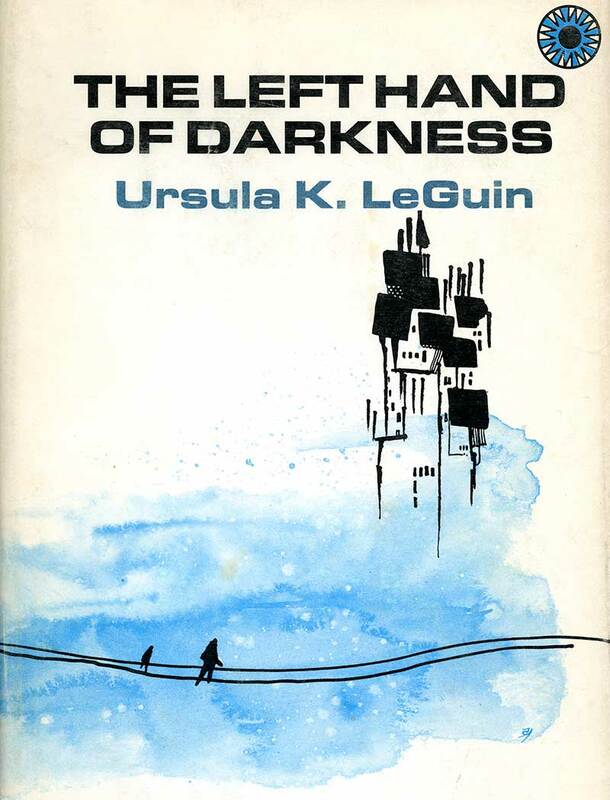 Published to great acclaim in 1969 and since translated into more than 30 languages, Ursula K. Le Guin’s The Left Hand of Darkness is an acknowledged world classic of speculative fiction. 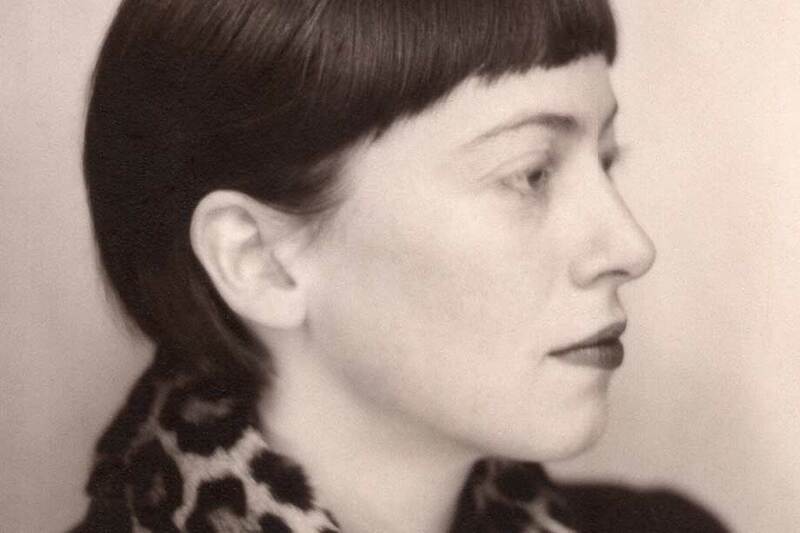 Le Guin’s novel transports readers to Gethen, a wintry planet inhabited by an androgynous (perhaps more accurately, ambisexual) people who only experience active sexuality for a brief timespan, once per month—and who may assume either male or female physiological roles in sexual and reproductive relations. The book’s narrator, Genly Ai, a male envoy from Earth, is the only character in the book with a nonfluid gender identity. 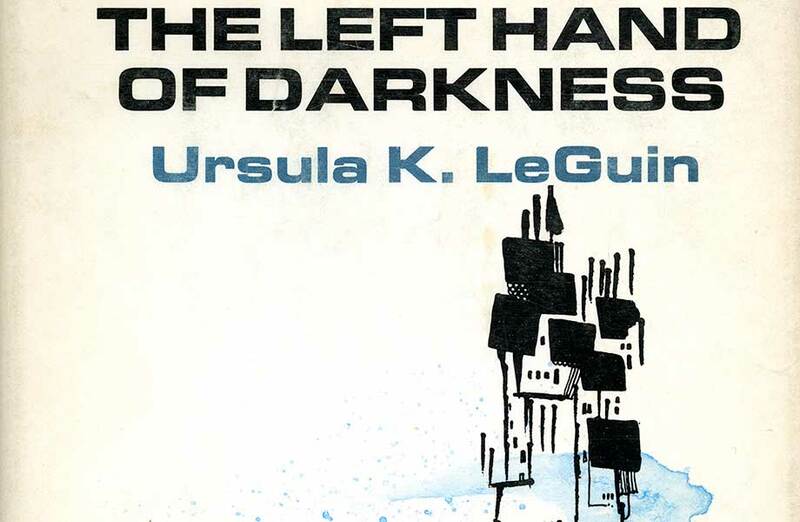 Probably Le Guin’s most famous and widely read work, The Left Hand of Darkness perfectly encapsulates many of the author’s major themes and exemplifies her longstanding practice of intentional creation. A Musical? In Science Fiction? Schmor also decided to take another drastic approach to this adaptation. Music plays a prominent part in the book, and was included in the Portland production. For the UO adaptation, however Schmor enlisted Brian McWhorter, associate professor in the School of Music and Dance, to complete the score and compose the theme song as well as ensemble pieces. McWhorter, an accomplished musician, nationally recognized composer, and director of music for the Eugene Ballet, admits it was a difficult task—he read the book and studied the role of music in it. Weeks passed, then months. Schmor hadn’t heard from McWhorter, so he sent an email wondering where the score was in the process. On stage, Schmor has the actors assembled into a circle; they are blocking a scene where the future is told by a group of “foretellers,” harnessing the energy of an unknown force. Schmor has them sit on the floor then raise to a standing position again and again until they rise up as if being pulled by a string. It’s seamless, and though it takes some of the actors longer than others to accomplish the feat, within a few tries, they all have it. He has them raise their hand; just one, the left. He instructs them to hum at the same time, one, long monotone note. All of the left hands are in the air, shaking and moving, while the sound of the hum resembles the resonance of a beehive. The hand that reaches in the air and searches for answers, the left, is significant, reflecting the title of the play. Christopher suddenly gulps for air, and the humming halts. It is clear that he is happy, that he has brought a scene from a legendary book to life with these students, most of whom had not read the book before the first table read. He knows that the opportunity to work hand in hand with Le Guin is phenomenal. For the students, the chance to perform in a production that not only has input from the author but also reveals layers of the narrative that were undiscovered is one that will likely never happen again in their careers. In the upcoming weeks, the stage will be fitted with wheels that poke up from the stage like tulips to accommodate a revolving platform, a unique staging element that is the most challenging the theater department has ever attempted. The costumes, vibrantly colored and reflecting the Arctic-like climate of Gethen, will be stitched, fitted, and tailored. The chorus of voices singing the same note will become smoother and McWhorter brings his ear and insists on take after take. As the play is formed and begins to take shape, it will change, evolve, and transform into something completely different than it was at the table read that took place the first week of the session. The process of a book becoming a play then becoming a message is something that everyone involved is certain to hang onto for a while to come. “I think the students probably find it a bit different that the director can just add or cut a line, and that they have some say in why and how!” Schmor says. “I also think it’s probably going to be very rare in their lives to be dealing with sci-fi/fantasy on stage—this kind of storytelling is most often done in film or television. Lastly, I think they’ve all been challenged by the questions—physical, vocal, emotional—that rise from having to imagine and then portray a person who is neither male nor female. I’d bet that’s the biggest thing we’ve all had to engage." The University of Oregon Libraries is honored to hold Ursula K. Le Guin's literary papers in our special collections. A Portland resident since 1959, Le Guin began donating literary papers and materials to the UO Libraries in the 1970s. In addition to the original manuscripts of classic works like The Left Hand of Darkness, the library’s Special Collections and University Archives house the author’s original correspondence, artwork, photography, and a wealth of ephemera from her public and personal life. These collections are not just musty archives—they continue to create a legacy of living and vibrant scholarship at the university. Along with the Center for the Study of Women in Society (CSWS), the UO Libraries Special Collections and University Archives cosponsors the annual Le Guin Feminist Science Fiction Fellowship, supporting scholars’ research within these collections.